*This event is accepting funds to make this community event free for Trans people. To contribute, Venmo @LaneSpeidel. Make a Space for Me is an event series creating and building a space for trans, non-binary, and gender non-conforming artists/makers/thinkers and audiences. This event is typically ticketed, but the goal is to fundraise before the event to make it free for Trans/NB/GNC people to attend. The structure is looser, this will be a space both to witness scheduled performance, and to participate in unscheduled sharing. There will be dinner, resonance, bonding, community. 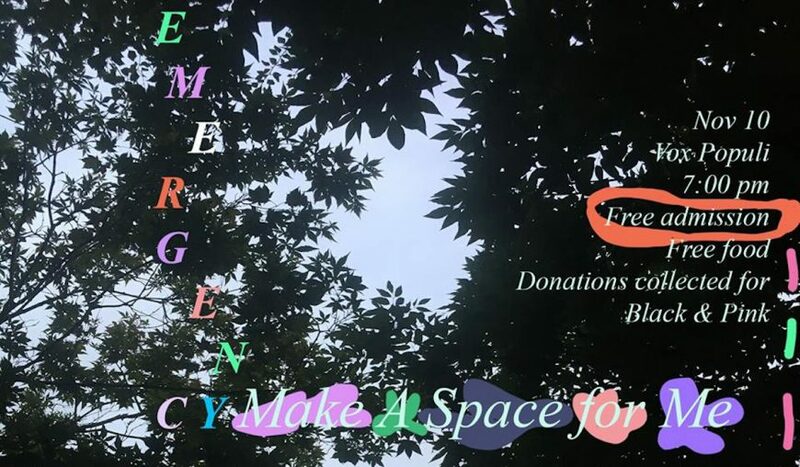 Food will be cooked by Marion Horowitz (she/they), there will be a resonance exercise lead by Leigh Marques(they/them), a performance by Kari Drame (they/them), an active Imagination ritual lead by Maggie-Malachi Lily (they/them/fae), a musical jam with Eppchez Yes (em/em/eir) and friend, and tarot card reading by Sa Ra Hk (they/them). As always, any individual who attends this event and participates in misgendering will be expected to leave. The goal is to raise $700 to pay for all the Trans folks labor to create this event for their community. The event will be free, but we will also be collecting donations for Black and Pink, an organization that works to support LGBTQ folks who are currently and formerly incarcerated. Any excess of donations that we receive for the event will also go to Black and Pink.